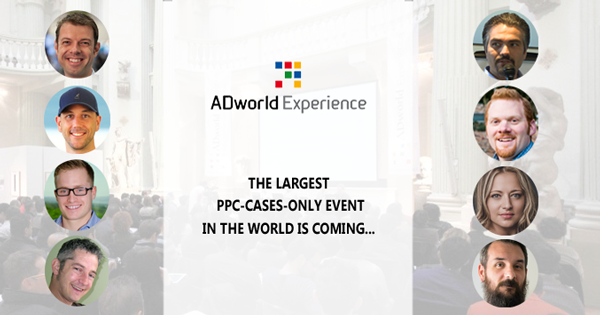 On April 12th and 13th in Bologna (Italy) there will be the seventh edition of ADworld Experience. A lot of time has passed since 2012, when I started organizing this event ;-). Since then we have seen on the stage many top speakers and a lot of very interesting cases and we have been rewarded by increasing number of participants and international recognition from year to year. Things are going very well for this edition too. I have managed to bring to Italy a group of super smart speakers (at least I hope so ;-), personally selecting some of the world’s best professionals in AdWords, Facebook Ads, Linkedin Ads and Conversion rate Optimization. There already are over 100 participants confirmed when there is more than two months left before the event. Among the speakers I strongly wanted on the stage for adwexp18 there will be (in no particular order): AJ Wilcox (LinkedinAds specialist, among the 25 most influential PPC professionals in the world), Andrew Lolk (a brilliant Shopping campaign optimizer), Pauline Jakober (regular contributor to SELand and SEJ), Tim Stewart (one of the smartest data analysts I’ve ever met), Miles Beckler (a very generous American Facebook Ads specialist reported to me by Jeff Sauer), JD Prater (former speaker in 2016 and now also among the most influential PPC specialists in the world), Ned Poulter (Pole Star Digital), Anu Adegbola (MindSwan), Duane Brown (Take Some Risk), Florian Nottorf and Christian Borck (CEO and Head of Development at Adference), Tomasz Sasiadek (Bluerank), Edgar Špongolts (senior optimizer at ConversionXL) and Liam Wade (Impression). Among the Italian speakers we can count on a group of top experts like: Massimo Chieruzzi (CEO of AdEspresso), Luca La Mesa and Veronica Gentili (among the most famous Facebook marketing specialists in Italy), Alessandro Martin (CRO professional with rare technical and communication skills), Michele Mereu (from Sardinia to the PPC world), Giuliano Trenti (Neurexplore), Cassandra Menga (Uptimization), Marco Frighetto (partner of Gianluca Binelli of Booster Box winner of the 2017 edition), Daniele Crescenzo and Luca Luzzani (SiComunicaWeb), Alessandro Frangioni (whom we have already had the chance to appreciate last year), Gabriele Benedetti (SearchOn Media Group), Francesco Chiappini (Ecommerce School), Angela Venturin and Rosario Toscano (Moca Interactive), Alfonso Mariniello (AdForm), Emanuele Chiericato and Luisa Fontana. I have selected many of them by spinning around the most important international marketing events and choosing the ones that in my opinion made the best and most useful presentations, or waiting as a spider in his web for interesting PPC cases proposals. 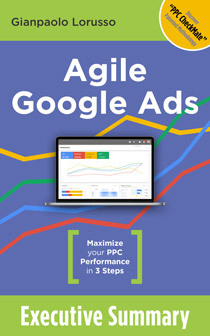 The goal here, as all other editions, is not to make money on the conference or to get visibility for me or the speakers, but to organize the best event on Pay Per Click worldwide. I do not know if we will succeed, but for sure this conference has absolutely nothing to envy to more publicized ones, and I am particularly proud of doing it in Italy.